The Hollywood Roosevelt Hotel, one of the most prominent architectural landmarks on Hollywood Blvd., was built in 1927 and hosted the very first Academy Awards two years later. 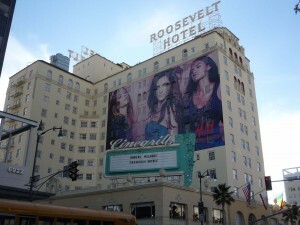 It gained fame as the haunt of such movie stars as Marilyn Monroe, Clark Gable, Carole Lombard and others. Designed in the Spanish Colonial Revival style, the 12-story hotel is listed on the National Register of Historic Places and the California Register of Historical Resources. 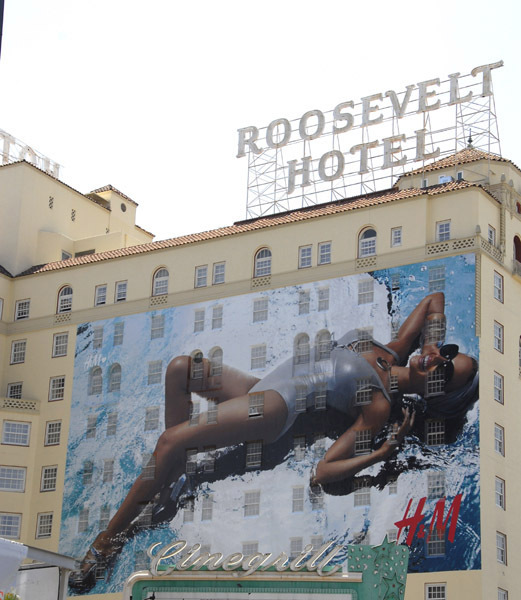 Owned by Thompson Hotels, a boutique hotel chain based in New York, the Hollywood Roosevelt first sported huge supergraphic ads in 2006. The company that installed these 6,000 sq. ft. plus ads, In Plain Site Media, was cited by the city’s Department of Building and Safety for failing to obtain permits or inspections for the signs. The company then applied to the city for permits. Last July, the Cultural Heritage Commission voted to deny the application, but one of the supergraphic signs still remains on the east side of the building. Do you want to tell the owners what you think of their custodianship of an historic building? Send an e-mail to Thompson Hotels CEO Stephen Brandman at sbrandman@thompsonhotels.com.